"It's a real honour to be in the city and to come to a school where kids are learning to play music and drums." Rhythm Magazine, the world's leading authority for drumming, teamed up with The Academy of Contemporary Music (ACM) to host an intimate, invite only masterclass with Chad Smith - drummer of one of the world's biggest bands, The Red Hot Chili Peppers. Rhythm magazine are long-time supporters of ACM (www.acm.ac.uk), as Chris Burke, the magazine's editor explains. "As one of the UK's biggest music colleges, with great facilities, top tutors and great courses for drummers, ACM is a perfect partner for Rhythm magazine. Like ACM, we pride ourself on our comprehensive educational content with video drum lessons from the UK's finest tutors given away every month on the Rhythm Lessons CD." Just to be able to come and give back a little bit - I'm just really excited and happy to be here. ACM, which connects directly to the music industry to offer an immersive and comprehensive learning environment, hosted Chad Smith, a long standing patron of ACM, at their brand new facility in Clapham, London (they also have campuses in Guildford and within Metropolis Studios, Chiswick). ACM students were treated to an exclusive intimate performance by Chad which was followed by an audience Q&A session with the drummer. Chad Smith said, "This is my first time at ACM London although I have a room named after me at ACM Guildford - the Chad Smith Room. London to me is such an important musical city and when I was growing up as a kid, the bands that I loved and the drummers that I loved the most were from England and a lot of them were from London; drummers like Keith Moon, Charlie Watts, Mitch Mitchell - so important to drumming history and for what they bring to music and how they influenced me. "So it's a real honour to be in the city and to come to a school where kids are learning to play music and drums. Just to be able to come and give back a little bit - I'm just really excited and happy to be here." "Giant of rock and funk drumming"
Chris Burke, Editor of Rhythm magazine, continued, "As well as our relationship with ACM, Chad and Rhythm have a long history together, with him having guest edited the magazine as well as gracing the cover many times. "He is a giant of rock and funk drumming whose entertaining delivery has made him one of the world's best drum clinicians, inspiring drummers young and old across all genres of music. We are extremely pleased that ACM and Chad approached us to partner this event." 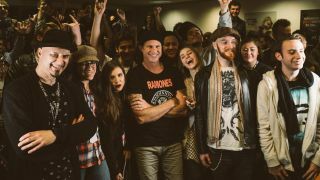 Ace, Head of Creative Industry Development, ACM (and Guitarist for Skunk Anansie), says, "We're thrilled that alongside our long-standing friends Rhythm magazine, our patron Chad Smith treated us to a masterclass at our brand new London campus. "As innovators in music industry education, it is extremely important to us to work with inspirational figures to show our students first-hand how they can make it in the music business. This year already we have seen masterclasses from Lower Than Atlantis Drummer, Eddy Thrower and Beanie Bhebhe of Rudimental, so Chad Smith was an excellent addition to this already star-studded lineup of drummers."